Very pretty vintage ceramic butterfly will look amazing in a 1960s or 1970s retro kitchen, bathroom, living room, bedroom, dorm room or anywhere you want a groovy sixties or seventies decor! 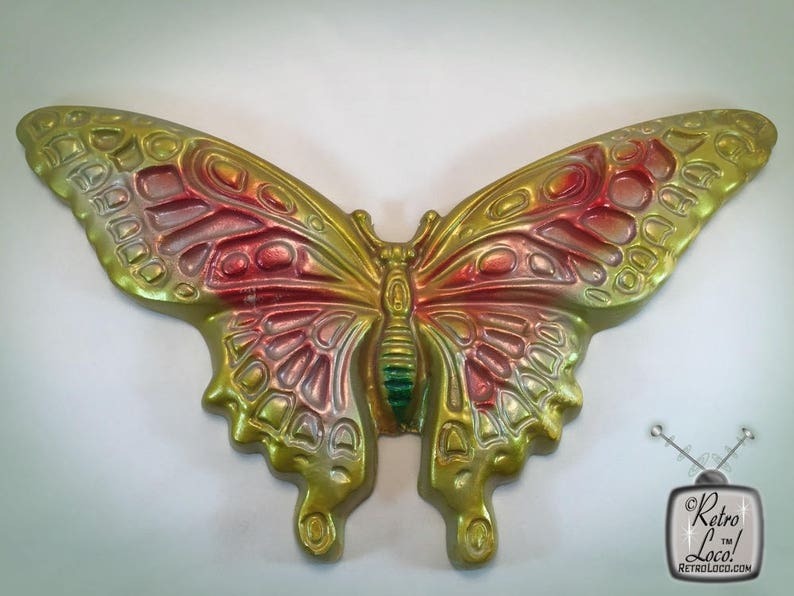 This feminine butterfly wall hanging/plaque is in great vintage condition. Cute, nostalgic gift for a hipster, hippy/hippie or for someone who loves butterflies. It is unique and has a lot of pretty details and would look especially cute in a girl's bedroom. The back side is flat and has a little metal wire for hanging on a wall. ❉ What you will receive: One ceramic butterfly. ❉ Color: Gold, pink and a little green. ❉ Condition: It is in great condition and is very pretty and shiny. It has a tiny chip on top of one butterfly antenna, but it is not very noticeable (please see photos). Along the plaque's edges that will lie against a wall are a few very tiny almost "fleabite" chips. These fleabites will not be noticeable once you hang the plaque on a wall, and I had to really search to find them! The back side is off-white. The back looks like it was set on top of some paint while the plaque was being painted and has some paint streaks on the back - no big deal, because once the plaque is on a wall the backside will not be seen. Vintage collectibles, Art & Gifts for Pets & Geeks!